You have the power to provide hope. Start changing a child's life today. Would you like to make a difference in the life of a child living in Africa? With your financial assistance, you can help to provide water, food, education, health care and community to meet the physical, spiritual and emotional needs of a child otherwise condemned to a life of poverty. 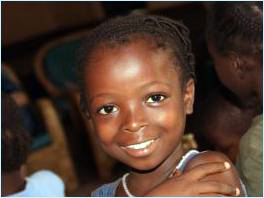 Our sponsorship program is currently operating in Kenya, Sierra Leone, Uganda and the Democratic Republic of the Congo. Learn more here... or visit our Frequently Asked Questions for further information on sponsoring a child. We accept two methods of payment: payment by check or online monthly subscription signup through PayPal. Basic sponsorship costs $30 USD per month and is used towards the cost of food or education for the child. Full sponsorship is $75 USD per month and covers the cost of food and partial or the complete cost of education. We encourage you to be faithful in your prayers and financial support and appreciate a minimum commitment of one year, although our prayer is that a lifetime commitment will be formed between you and your sponsored child. 90% of your donation goes directly to our African partners to care for the children and 10% is used for our administrative costs. We accept monthly, quarterly or annual checks, as well as 12 post-dated checks (dated the 1st of the month). If you have any questions, please feel free to contact us. Click here to print and send this form by regular mail.